Great idea Dennis. That will look awesome! Damn, I have not even built my first P10 panel yet - PiHat expected Tuesday, and I have now ordered 7 P5 panels (6 plus one spare) for another matrix... This stuff is addictive! 72 universes for six panels (gulp). News to me. Mine did not come with heat sinks separate from the Pi. I'll have to look at it when I get home to see if there were any already attached - I don't remember seeing any. I have never needed them and am running 32 panels. Which PiHat did you order? The Nano-matrix has one output and the matrix has three (ignore the part of the URL that says Pre-sale - they have them in stock). Thanks for the feedback. I just added CFOL's pre-sale "Matrix PiHat" to my pre-sale order. I'll use the matrix more as a backup and for future expansion of P10 sign/prop. I don't need these P10 items immediately, so I'm willing to wait for CFOL to fill the entire order. Yesterday my two PiHats actually made it to me (only took two days to get from the mail room to me - 100 yards away). So did the second Raspberry Pi 3. So last night (to keep the story short), I configured the second Pi and hooked up two panels and after some parameter changes, I got the panels to light both from the test lights utility in FPP and from LOR! WooHoo!!! 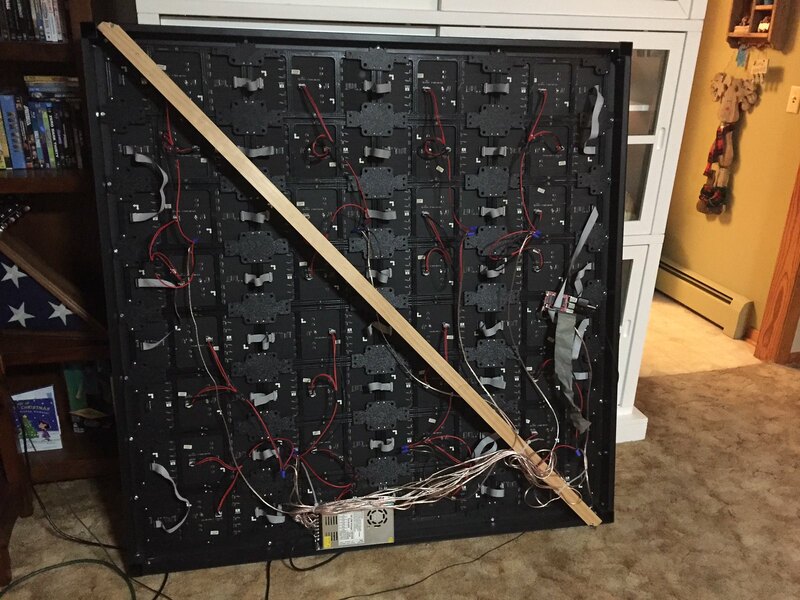 Tonight I will hook up more of the panels and do some more testing. BTW, in the useful information department for people planning P10 panels, I measured the current draw in full white. Came out to about 2.1 amps per panel. I assume you mean adjusting brightness of an entire prop with one setting - since you absolutely can control brightness of RGB channels in LOR. One of the "playing around" that I did in LOR last night was ramping and shimmer of some effects. Worked just fine. I expect to have between 8 and 12 panels up this evening. As for total power draw, I expect to have both matrix Tune To signs (12 P10 panels in one and 6 P5 panels in the other) plus between 50 & 250 GE Color Effects bulbs, and a SanDevices E682 powered off one 70 amp power supply. The Pi 3s will be powered separately from a battery backed up source. Both FPP on the Pi and on the BBB have options to set a brightness level of the P# panels. For the P# panels, there is a big advantage of doing it via the FPP setting instead of in xLights or LOR. When you do it in the sequencer, you reduce the number of shades of color that can shown. For example, at 50% brightness, you get 0 to 128 for each channel instead of 0-256. When doing it via the FPP setting, for the P# panels (this doesn't apply to the ws2811 outputs), FPP can control the width of each "on" pulse so it dims by shortening the On pulse for each "bit". Thus, you can retain the 256 shades for each color. Thus, images and such can look a bit better. Thanks. I would completely agree that any such adjustment should be in the device driving the lights, not in the sequence. Glad to hear that it is there in the FPP software. I had not gotten far enough to look for that, but will aim to do so. A quick look though the manual did not find that capability. Where is it? Congratulations!! Exciting news in "Pi and P10s" department. Loading FP and booting the Pi into FP is is not enough excitement -- you had to go ahead and get the P10s connected and flashing. 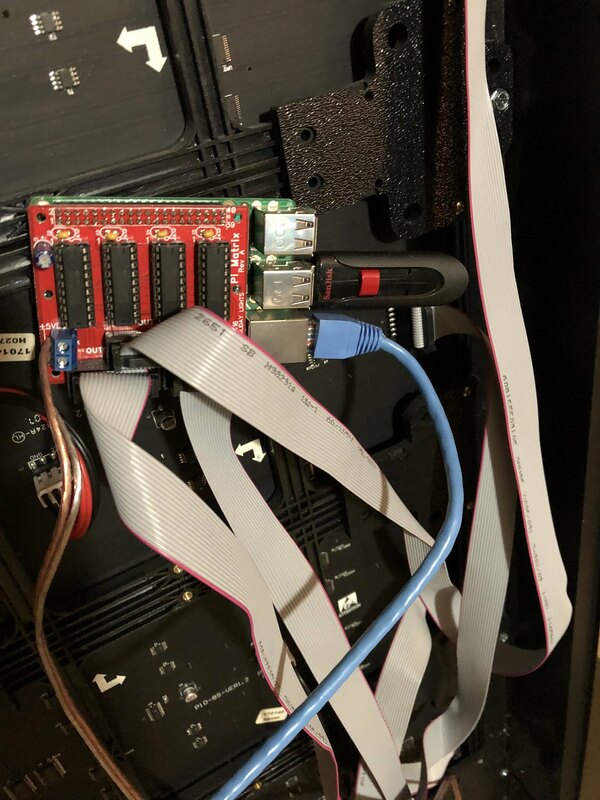 Any detailed pix of the Pi, Hat, and ribbon-connected-to-Hat assembly that you can share? That's good information to know. For my puny P10 prop just 6 panels, I can power them from excess capacity of a nearby 12V 30amp PSU. I promise, the message prop will never by all white and 100%. BTW, k6ccc, I agree 120% on your comment in another thread about S5 going backwards for us who ONLY use SuperStar (ok, maybe one PE sequence). I can power them from excess capacity of a nearby 12V 30amp PSU. I have seen that happen!! Thanks for warning. I'd forgotten about that. I have a spare 5V PSU I've never used - now I will. Thx for the backside picture. Shows power and ribbon "schematic". Do you have any close up of that Pi assembly at the middle right of your football stadium ready assembly (err, large prop)?